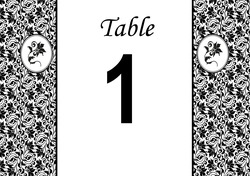 Free Table Numbers are print quality (150dpi) but for the best quality try our Premium Table Numbers in super professional printing quality (300dpi) and without the www.freetablenumbers.weebly.com watermark. Click the button for your favourite design below for secure payment. through PayPal. Table Numbers 1 to 12.